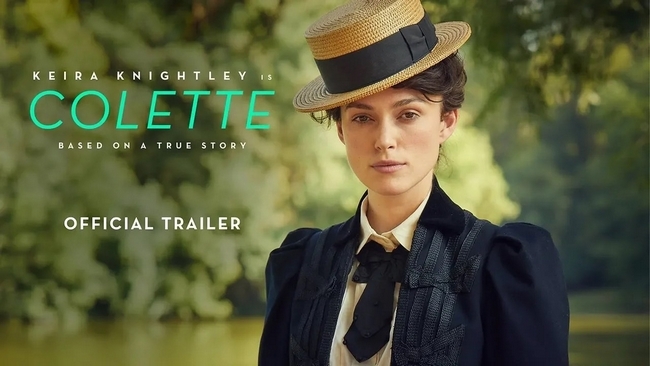 Colette is a 2018 British biographical drama film, directed by Wash Westmoreland, from a screenplay by Westmoreland and Richard Glatzer, based upon the life of the French novelist Colette. It stars Keira Knightley, Dominic West, Eleanor Tomlinson and Denise Gough. It had its world premiere at the Sundance Film Festival on January 20, 2018. It is scheduled to be released in the United States on September 21, 2018, by Bleecker Street and 30West, It is scheduled to be released in the United Kingdom on January 25, 2019, by Lionsgate. Here is a synopsis: Set at the dawn of the modern age, Colette is the story of a woman who has been long denied her voice going to extraordinary lengths to reclaim it. Gabrielle Sidonie Colette, a young woman from a country village, marries a charismatic dominating Parisian, fourteen years her senior, known by the single name, “Willy”. Through his auspices, she is introduced to bohemian Paris where her creative appetite is sparked. Ever quick to capitalize on talent, Willy convinces his wife to write novels, to be published under his name. The phenomenal success of her “Claudine” series makes Willy well known as a writer and “Colette and Willy” the first modern celebrity couple. Over time, lack of recognition for her work frustrates Colette, and an affair with the gender-defying Mathilde de Morny, Marquise de Belbeuf inspires her to break free, but Willy is determined to maintain his hold over her, at any cost. This clip is the official UK trailer of the movie.